Looking at the automatically generated ZHR plot from worldwide visual observations, the Perseids of 2010 managed to produce a prolonged plateau with a zenithal hourly rate around only 80, lasting for almost 24 hours from noon to noon UTC of Aug. 12 and 13 - but sitting on it is a sharp peak of ZHR ~130 at 17:00 UTC on August 12: This could be a dust trail produced by the parent comet in 1479, though - as CBET #2416 of 17 August warns - the peak is only "based on roughly ten visual observers located in China, Russia, Japan, and Israel." An encounter with that trail had been predicted by several modellers though perhaps not with such an amplitude. For those not encountering the extra peak and/or sitting under mediocre skies the 2010 Perseids were not the great show all too many overblown stories had promised once again - seen under good conditions it was fun, though, as early reports and analysis here (earlier), here, here, here, here, here, here, here and here (earlier, earlier, earlier and earlier) show. Picture collections can be found e.g. here, here (blog; more), here, here, here, here, here (lots of meteor-free pics, too - d'uh), here and here. Elsewhere in the Universe a few more impressions from the total solar eclipse last month: a panorama by yours truly from Argentina, I've been made aware of what may be the trashiest eclipse video ever shot in Chile (in the continuation the umbral cone is visible briefly in the sky, though), and stuff from Rapa Nui, Tatakoto and Hao - and the aftermath on Mangaia. • From the Sun itself vis. vs. H-alpha on Aug. 15, two spot groups, the Aug. 7 flare and more CMEs, the earlier aurora and some activity coverage here (earlier), here and here, also on invisible aurorae, flare warnings (and scares), the Sun's 'conveyor belt' changes (more and more), the role of the Cluster mission and an alleged role of the Sun in jetstream blocking. • The proper motion of 61 Cyg visualized, the status of Eps Aur, a 38-hour exposure of the Vela SNR, Herbig-Haro 32 and an ISS Sun transit. • The 'Star Hustler' Jack Horkheimer (more) has died yesterday (more). • A video about and some fun telescopes from Stellafane 2010, a photo prize for an Orion Nebula, the Wilson & other awards - and a cool VR picture of The Dish & the sky. Solar action brings aurora even down to Germany - bye, bye, minimum! The coronal mass ejection(s) of August 1 briefly mentioned last time have turned out to be surprisingly effective: They caused a geomagnetic storm lasting for half a day, leading e.g. to the first directly visible aurora over (Northern) Germany in some 5 years during the night 3/4 August. The best pics from Germany, esp. these, radio effects, Scandinavian views, a global gallery and more pictures and videos (alt., alt.). The best source - in German - when things 'turn on' was once again the AKM Forum. The solar activity and effects were also covered by NASA (apparently earlier wording and earlier release plus a hi-res SDO video from Aug. 1), the CfA (earlier) and the SPWC on Aug. 5, 4, 3, 2 and 1. The solar & earthly events led to ample coverage in media, blogs and websites over almost a week, e.g. on SpaceWeather (on a later flare w/o likely terrestrial consequences; earlier, still earlier), BAA Blog, NASA FB, Nightsky Guy, Sky & Tel., BBC, Telegraph (earlier), Discovery, Daily Mail, Universe Today, Cosmic Log (earlier), Time, Space.com, New Scientist, Starts with a Bang, Bad Astronomy, Astronomy Now (earlier), CNet, Boston Globe, 3News, Science Journalism Tracker, Space Today, DLF, Spiegel (früher), n-tv, Astrodicticum. There is also a primer on aurora forecasting, a portrait of sunspot 1092 which caused it all, thoughts on spot 1093 and the cycle's rise, also covered in the Chandra Blog - and a huge review of solar magnetic field issues. More interesting pics of the total solar eclipse of the 11 July have emerged (or been 'discovered') - including a view from Tahiti just outside the track of totality but the corona is seen! Or the eclipse from Hao as shot by one of the Google founders (another report), many views from Tatakoto or from the air or Rapa Nui (also a slide show and a report on Catalan TV). From Argentina's El Calafate a remarkably video of the corona sitting on the Andes (also here) and a wide-angle video from above the town. 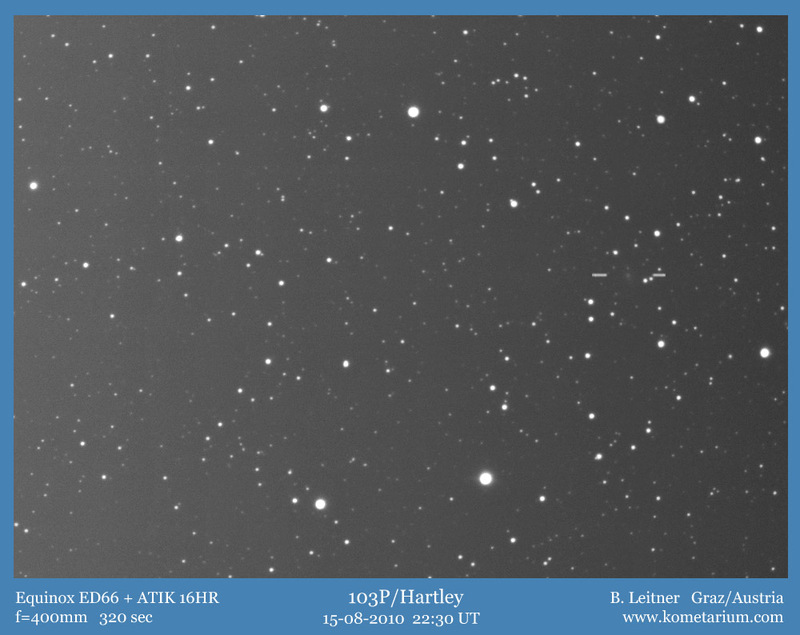 From the Cuesta de Miguez farther east your's truly is now on APOD (German version), and there is a great wide-angle video of the Moon's shadow in the sky, plus a hi-res video. The eclipse was also covered in a Catalan newspaper - and its live webcasts were screen-grabbed here. 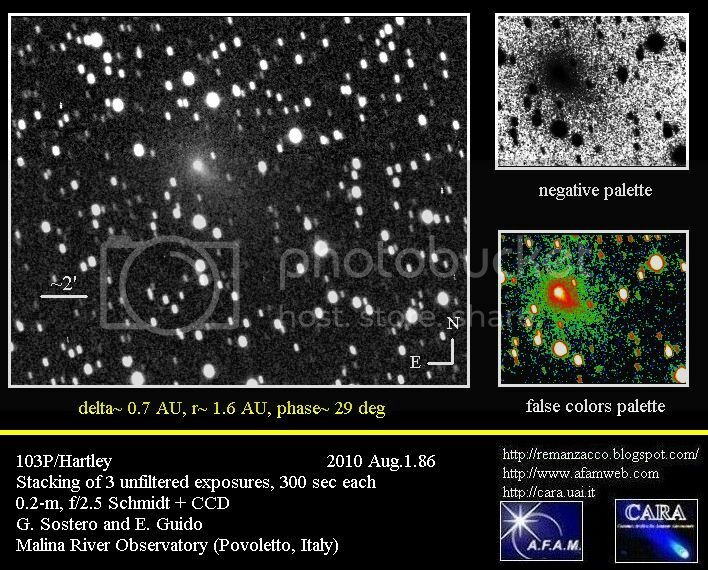 • Finally of the great planet triangle in the evening - mentioned here, here, here and here - pictures of Aug. 7 from the U.S. and India (w/Mercury, also earlier views), of Aug. 6 from the U.S. (again), Brazil (w/Mercury), Germany and Italy, from Aug. 5 from the U.S. (again) and Australia), from Aug. 4 from the UK and Australia (more), from Aug. 3 from Brazil, the U.S. and Australia, from Aug. 2 from Brazil (w/Vesta), the U.S. and the UK and from Aug. 1 from Austria - where all 7 planets were imaged in one night. Plus more from late July. Next show: The lunar crescent passes the trio Aug. 12-14! The planets Venus, easy even under adverse conditions, i.e. a high northern latitude plus haze, Saturn and Mars are moving closer together in the early evening sky this month, even forming an equilateral triangle at one point. Already in late July the latter two had been close together; before the three planets had formed a long line: pictures of July 31 (more, more), July 30 (more, more, more), July 29, July 21 (more) and July 5. The triangular show is also explained here, here and here while this, this, this, this and this page preview other August events. August 5: The three planets form a 'perfect triangle', fitting into a 10x50 binocular FOV if necessary. August 7: Mercury in greatest Eastern elongation at 27° - but still hardly visible from mid-Northern latitudes. August 8: Venus & Saturn just 3° apart. 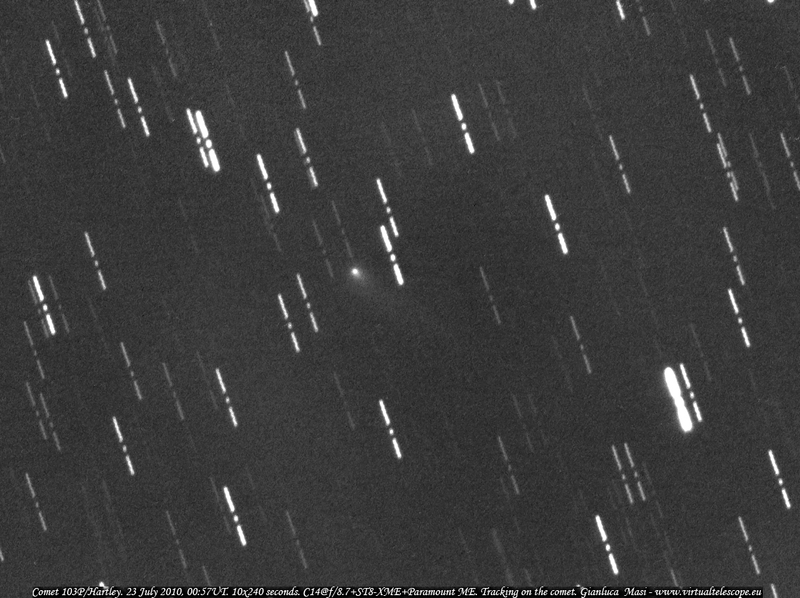 August 12/13: Maximum night of the Perseids, as previewed here, here, hier and here. The rate can be tracked here, and there'll be another "MeteorWatch", hopefully less noisy & more useful than last year. August 13: The young crescent Moon, 3 days old, joins the planet triangle. August 17: Venus at half phase. August 19: Venus & Mars 2° apart. August 20: Venus at greatest elongation, 46°. 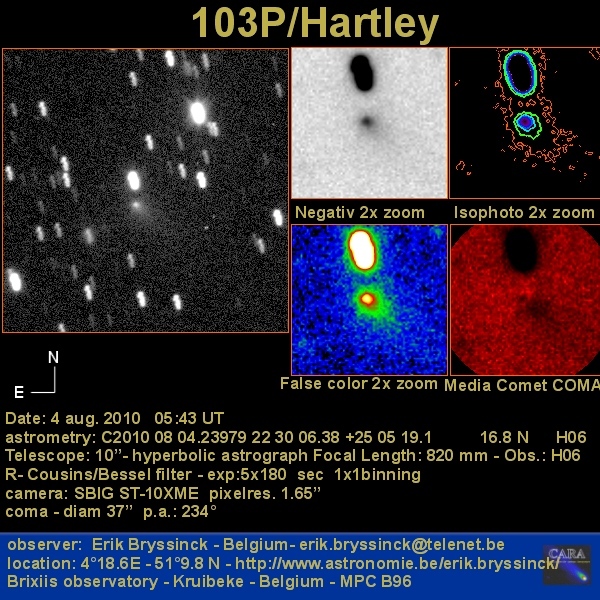 In other news more images and reports from the 11 July total solar eclipse have come in: from Hao & Hikeru (Baily's Beads in detail; more from Hao here, here, here and hier, plus a video), Anaa (more), Tatakoto (more, a video [edited! ], another one and a telescope donation), the Aranui 3, the Paul Gauguin (an edited video), Rapa Nui (from this story; more), Chile (partial) and Patagonia (best hi-res pics; more [more], more, more [50+ pics by yours truly] and more). • The Sun has just unleashed a CME at Earth, also reports on 'space quakes', SDO's flare stats and achievements, the SUMI flight, the shrinking thermosphere and alleged solar cycle effects. • Pictures of Jupiter & Io and Uranus & its satellites - and Neptune is back to where it was discovered. 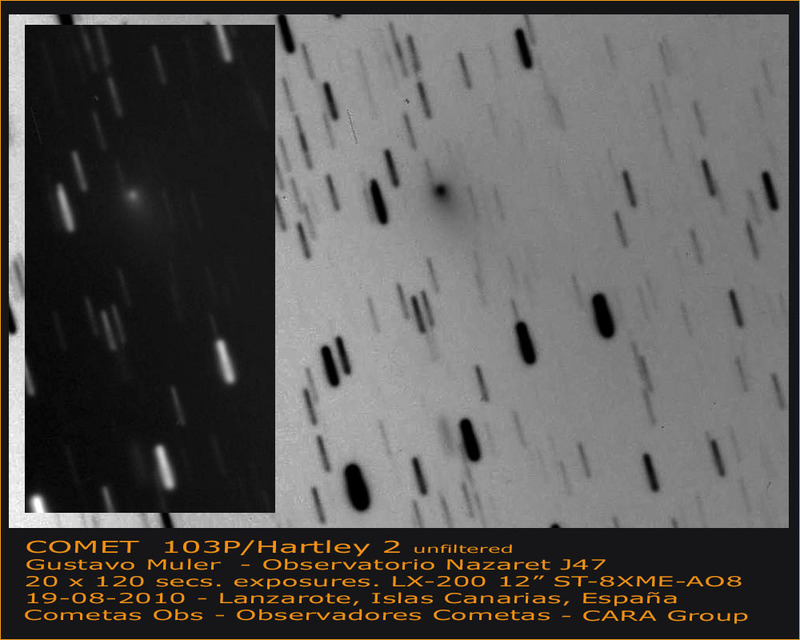 • The trail of comet 10P exceeded 20° (from here), and pictures of spacecraft target/fall sky show 103P/Hartley 2 from July 23, July 22 and July 4. • A Phoenix fireball, SDA over Singapur, and a meteorite fall during a cricket match (more). • More on the fresh Kamil crater & meteorites here, here, here, here, hier, hier und hier; also a press release on the C/2010 A2 mystery. 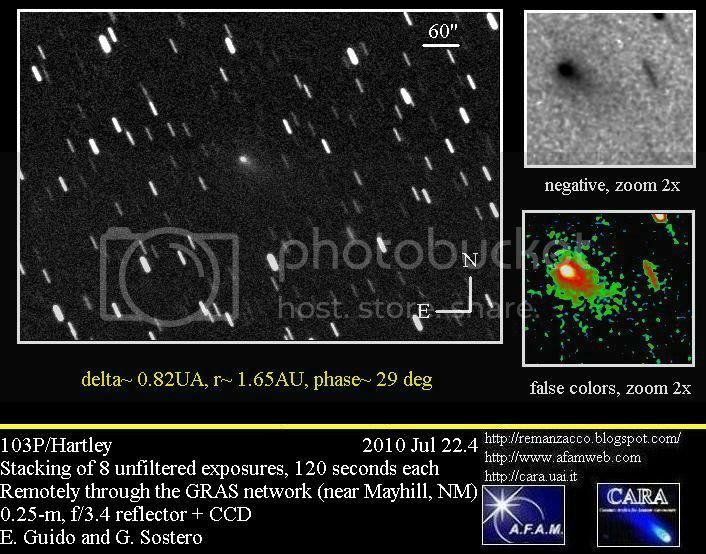 • Observations of the stellar occultation by Roma with automated stations, and Keck AO observations of multiple asteroids. • this press release w/o new data but probably linked to this mission candidate caused lots of unnecessary headlines, as discussed here, here, here, here, here and hier. 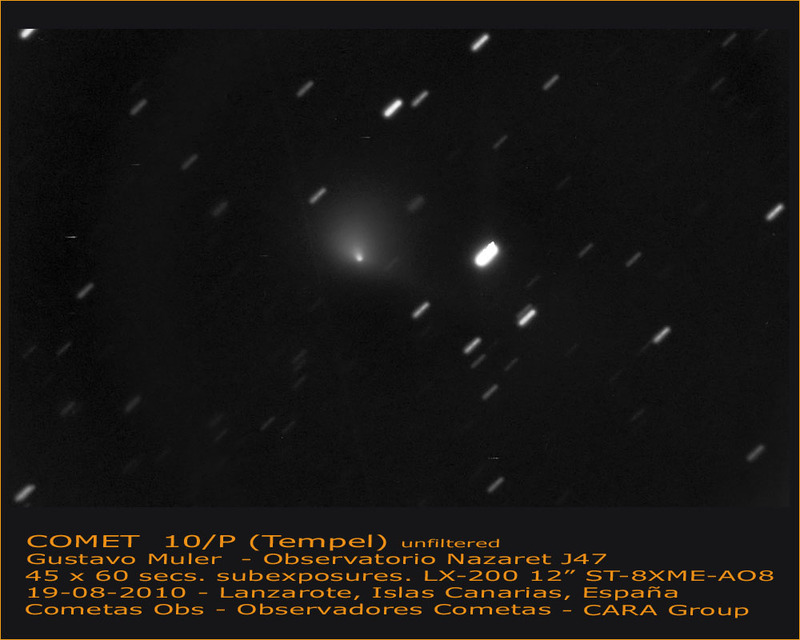 • Also speculations on Trojans & comets, it's mid-eclipse time for Eps Aur, and nice NLC pics come from Sweden and Finland.